The movie is not very funny and on top of that, it’s got a predictable plot that you can see coming from a mile away. There are definitely a few laughs here, and yet more often than not, the movie tends to be stupid rather than funny. To make matters worse, the story is ridiculously predictable. Whether it’s a gang leader who promises he will show up in a town in a week, returning to the town again, as if we were supposed to forget he was coming, or a girl who dumps the hero wanting him back again after he proves himself, we’ve seen all of these cliches before. The humor does occasionally work, and it’s the only thing redeemable about this overall pretty lousy movie. 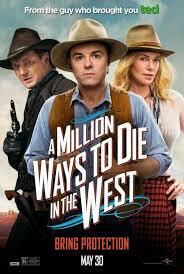 A Million Ways to Die in the West is not very good. it’s not terrible, either. that’s because this is a seth macfarlane film, which means even if most of the jokes don’t work, some of them will, and they will as a general rule be more inspired then most comedies around these days. the one thing macfarlane does that other comedies don’t do, is he comes up with his own material. he doesn’t repeat jokes that we’ve seen a thousand times before in other movies. now, plenty of his jokes fall flat, but at least they are his own thing. this movie, like ted, holds nothing back. there it was a good thing. here it’s not. 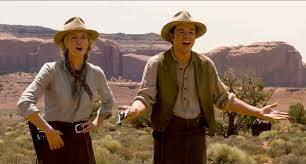 in a million ways to die in the west, the humor is more gross than it is funny. especially when it comes to all of the poop, piss, and fart jokes. the opening, however, sets the tone as there’s about to be a shootout in the street and instead of standing up like a hero, albert (macfarlane) makes shadow puppets that turn into one guy going down on another. soon he’s doing voices and acting out a whole scene with the puppets. it might not be funny, but at least the tone is established. that brings us right into the plot. albert gets dumped by his girlfriend, louise, (amanda seyfried.) she can’t be with a guy who is a coward. instead, she has chosen another man, the mustache twirling, foy (neil patrick harris.) foy owns a mustache shop and everything about this guy is mustache-related. that includes a song he sings and dances to, where the lyrics say that the only thing that matter is if you have a mustache. this is the definition of one-note material. luckily, it’s at least funny at first, even if it does grow tiring pretty quickly. i do like the scene where albert visits the mustache shop and talks about considering growing a mustache himself. right after he gets dumped, albert goes to see his best friend, edward (giovanni ribisi.) edward has a unique situation. he is in love with his girlfriend, ruth (sarah silverman), and doesn’t mind that she’s a prostitute who works in a brothel. his problem is that she refuses to do it with him. apparently the two of them are both religious folk and so they believe in not doing it until they are married. at least not with each other. so every day she goes at it with all these men who could care less about her, but she refuses to do it with the man she actually loves, who treats her right. this is another joke that is repeated a few too many times throughout the film. it’s somewhat funny at first, but boy does it get tiring after that. all of this is the setup of the film. there’s the love triangle between albert, louise, and foy, and then there is albert’s friend, edward, and his girlfriend, ruth. the new situation in the movie isn’t really the getting dumped business. it’s a character who rides into town and who nobody knows. that would be anna (charlize theron), who is actually the wife of the gang leader. clinch (liam neeson) is the meanest man in the west, and he leads the gang of ruthless pack members. when they come across a man who won’t turn over the gold he found, and instead lies to them about it, they kill him. they even do it after he has already given over the gold. conventiently, of course, the brother is removed from the occasion, by getting himself locked up in a bar fight. this happens to be the same fight in which albert rescues her from getting flattened, and then takes her away from the bar to court her with conversation. he tells her all about getting dumped by louise. she offers to help him get her back. at this point the movie is becoming way too cliched and predictable. do you think he might fall for anna instead of louise, this new girl who he is about to start spending more time with? All of this leads to the fair, where Albert and Annie go on a date. People die at this fair of some unnatural causes, but other than these running gags, there’s really not much funny here. There is a moment when they run into Louise and Foy, and Albert stumbles over his words when describing where he lives in relation to Annie. This joke might work, but not much else in the scene does. Especially when the predictable plot come creeping right around the corner. We know that Clinch will be returning to town in a week to pickup his wife, so we know that trouble is coming and exactly what it is and when. Maybe they were going for a High Noon approach with this, only the hero doesn’t know what’s coming, and it seems like the movie is hoping we will forget, so that they can surprise us later. It doesn’t work. If the plot made any attempt to get creative or avoid cliches and standard storytelling, this might have been a better film. As it is, this is a predictable and mostly unfunny mess. Knowing exactly what’s going to happen the whole way through really hurts the film. At that point, with plot pretty much taken out of the equation, all that’s left is the humor, and it is very hit and miss. The scene where one man can’t fight because he is too busy going to the bathroom in another man’s hat is an example of the lousy humor on hand here. Another one involves a herd of sheep peeing on a character. This is pretty amateurish stuff, and MacFarlane can certainly do better.